Our instructors are the heart of our studio, their passion makes us who we are - and when they shine, we shine. With healthy lifestyle knowledge that comes from learning to live abundantly with intention, and the life lessons earned through experience, they will guide you in how to explore a vibrant, vital, joy-filled practice...and life. Together they've found a beautiful energetic partnership, fulfilling a sacred contract to ensure our students are well-cared for and the studios are thriving. Michelle takes care of all the behind the scenes tasks of running the business side of things, while Anne walks the teaching path with grace, guiding our students at the studios, mentoring new instructors, and directing our Teacher Training program. Both working in service to our local yoga community...and beyond. Anne is our studio manager, the director of our Yoga Teacher Training program - Amalam School of Yoga at Outer Banks Yoga, and the heart & soul of the studio. She has been practicing Yoga for more than 15 years. She began her journey in France when she was traveling often between Europe and Indonesia and felt she needed a nourishing practice that she could bring with her anywhere. After she moved to the US she pursued her 500-hour yoga teacher certification. A beloved teacher, she leads classes that are truly dynamic and challenging, yet balanced with softness, relaxation and humor. She also instructs and trains teachers in pre-natal and kids yoga. Inspired by earth medicine and sufi poets, sitting amongst the trees and dancing in the rain with her daughter, Michelle finds yoga in the day-to-day of slow living. Her physical yoga practice began nearly 15 years ago and it has proven to be an unexpected and tender journey - not unlike a relationship with a partner - with all the exhilarating highs and defeating lows. Yet her mat has remained steadfast and at the ready. She enjoys leading restorative yoga classes that allow you to linger and examine some of the deeper questions held within. She is a mama and wife, and spends her days nurturing her family, the yoga studios and the creative voices of a global community of women through her sister endeavor, Animyst. Alex teaches vinyasa-style yoga, creating a dual focus between alignment of the body and attention to the breath. Her teaching works to remind us that the lessons we learn on the mat can be directly translated into our everyday lives. With an emphasis on cultivating love and support for those around us, students leave her class with a sense of community and overall wellness. She has been practicing yoga since 2015 and teaching yoga part-time since 2017. Alex became a 200-hr Register Yoga Teacher in May of 2017, after doing her training with Samantha Harrison at YogiVibes Studio. She plans to continue her yoga journey as a student and a teacher for the rest of her life, traveling around the world to learn different perspectives. The classes that Alex teaches combine the sacredness of yoga with a fun and inviting atmosphere suited for yogis of all types. She aims for her students to connect with each other by maintaining mindful thoughts, mindful words, and a mindful heart. I'm a proud father of two beautiful hard working college graduates and the grandfather of one amazing grandson. My family has inspired me to do my best and lead by example. Staying active and willing to learn has always been a part of my life. Early on my parents taught me to nourish my body with a proper diet. By following this advise I've maintained a healthy life style and enjoyed being a runner for over forty years. I studied Taekwondo under Master Hong Shik Chung and achieved my black belt. I'm an active soccer official working youth, amateur adults and High School matches and currently a USSF State Emeritus referee. I enjoy cycling the Outer Banks and volunteering for NEST. This is such a beautiful place to live. Having all this fun I still have to work, I'm the owner and operator of Altered Estates specializing in home renovations. Recently, in the scope of things, I've found The practice of Yoga. Bringing into focus this new world of peace, love and gratitude, rediscovering my body and mind. I'm so fortunate to have had the time to learn from Anne Follenbach-Howard for the past several years and completing her Amalam School of Yoga her at the studio this past winter. What a gift to have her locally. I'm also grateful for of the support from all the amazing local instructors, especially my love, Marcia Cline, that I continue to learn from as I start my path of instruction. I love the challenges of my growth as a Yogi because there is so much to learn and so much to share. I look forward in joining you on your path as we practice on the mat, but most important, the practice of achieving the balance in life as a Yogi off the mat. "Yoga has made my life whole." Anja's passion for teaching goes back as long as she can remember. She started her teaching career in her native Germany where she attended Leipzig University to become an English teacher. Back then she would have never imagined that 20 years later she would look back at a life here in the United States where she is teaching languages to high school students, where she raises her teen-age daughter and watched her son become a US Marine. When yoga entered her life about eight years ago, she fell in love with the practice and noticed how it transformed her into a happier, kinder, more patient person - flexible beyond the physical domain. Influenced and inspired by Anne Howard-Follenbach's dynamic yet meditative style, Anja recently studied under her guidance right here at our Amalam School of Yoga to deepen her knowledge and understanding of the art, and to earn her teaching certification. Yoga has had such a profound and healing influence on her life that Anja wants to share her passion and teach others the amazing benefits of asanas and pranayama. She hopes to make yoga available to a broad population with the understanding that "yoga is for everyone". I’ve been practicing yoga for 15 years, but allowed my consistent practice to wax and wane for much of that time. I know now that I feel the happiest when yoga is a part of my life and my time on the mat is a gift I give myself. The journey through teacher training (here at OBX Yoga with Anne) deepened my understanding of why I feel so good when I have a regular practice! I’m excited to share this with others. I’m so grateful to have found an instructor like Anne and to have shared the training experience with a wonderful kula. During the day, I work as the Public Information Officer for the Town of Duck. My home is shared with my husband Dave, our dog Odin, a corn snake, and a blue-tongued skink. I love the outdoors and enjoy spending time at the beach, on our boat, or in the garden. All human emotions are derived from fear or love. By studying the yoga philosophy with Anne, and through my own daily practice, I've learned to develop a silent awareness. I use my heart's innate intelligence to find a balance between survival and happiness: the logical mind and loving soul. Anne has shown me that through compassion and contemplation when at a crossroads, you can act dynamically without reacting on charged emotions, expectations, and circumstances inflicted upon us. Contentment can be found in any moment of our journey. It's about working towards what we choose to become and not being a victim of what happened in the past. The path of love and light. It's bringing the gOd light within us to the outside world. When teaching I can only hope to inspire students as Anne has done for me. Namaste. Initially, I was I was drawn to yoga due to the physical benefits of the practice; however, it did not take me long to realize yoga is so much more than what happens on our mats. My mind and body quickly opened to the real benefits of yoga. As I began to explore the yoga philosophies and continued my physical practice, I began to feel a sense of inner peace and a connection to my true self. I can honestly say yoga has transformed me. I am grateful for the teachings of Anne Follenbach-Howard. She is the one who inspired my yoga journey and encouraged me to complete my teacher training, which I completed through her Amalam School of Yoga in the Spring of 2017. I enjoy teaching to all levels and types of yoga. To me, the postures I teach are much less important than the ability to help others explore and experience all that yoga has to offer. I'm a proud wife and mother of an intelligent and independent 15 year old son. During my free time, I love to read, paddleboard, and spend lots of time with family. I hope you join me on my journey and allow me to be a part of yours! Joy has been teaching yoga since 1998 when she was certified as an Integral Yoga Instructor at the Satchidananda Ashram near Charlottesville, Va. She began taking yoga classes in 1992 on the advice of her physician to strengthen her lower back after a scuba diving injury. Not only does her back no longer “go out”, but she also discovered that yoga can be an inward journey to inner peace. 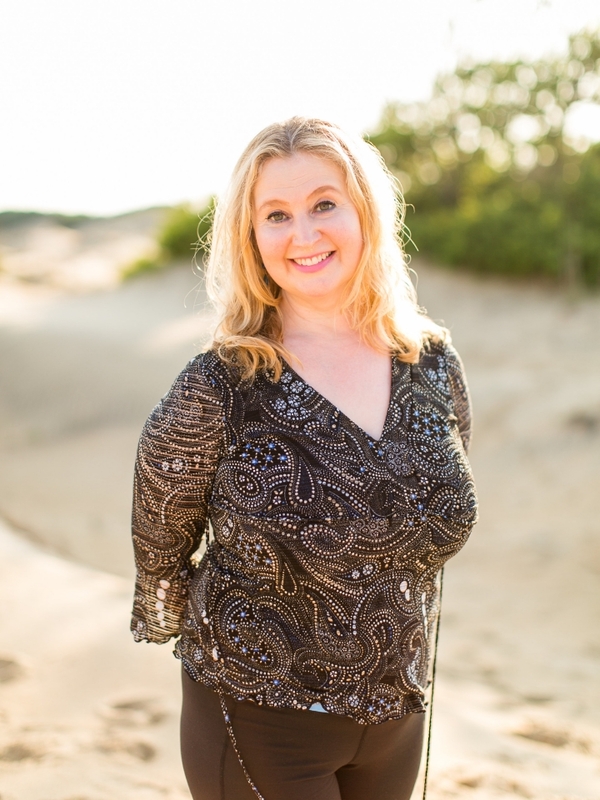 Being a “large” middle-aged woman with arthritis, she has discovered that working with her own imperfections and limitations has helped her guide and encourage others on their own individual journeys towards better health and inner contentment. Her classes have a meditative flow that includes asana, pranayama, relaxation, and meditation. The emphasis is on individual inner awareness rather than perfect alignment. Kerry believes core strength is the base of all fitness. Always physically active, she competes in triathlons, is an avid cyclist, runner and now explores a new sport – paddle boarding! In addition to teaching with us, she has been the Fitness Coordinator for the OBX YMCA since they opened in 2000, teaching numerous fitness classes. This year she received her 200-hour yoga teacher certification with us here at the Amalam School of Yoga under the direction of Anne Howard. She is very excited to begin a new journey instructing Yoga! Kerry has also been teaching Pilates for more than a decade, with certification from the Physical Mind Institute under the direction of Cynthia Clark in Charlottesville, Va.
Having been an athlete her whole life, she has also had her share of injuries and surgeries, which has merely reinforced her belief in the importance of a strong core that can be your basis for strength. These experiences also make her a terrific ally for those recovering and in need of thoughtful modifications. Having graduated with a BA in Communications Arts & Design she is also a fine artist showing her work in local galleries. She has been in the fitness world for 20 years, is mother of two, and part owner, with her husband, of a local restaurant. As a single mother and entrepreneur running an event design business on the Outer Banks, I decided one day to drag my exhausted, “Bad Mom” mess to Anne’s class. I didn’t think I could afford the time to do this. I didn’t have a mat. I could not understand what Anne was saying. I moved like Frankenstien on crack. It was awful. But… I really, really liked it. It just seemed to be everything this busy mom was missing….thought provoking, simple, physically challenging, humbling. Happier now more than ever, I completed my teacher training in 2017 and I am grateful for for the opportunity to share with my students, and other “Bad Moms” all the fabulous tools yoga has to offer. Tami is a registered nurse, Duke trained integrative health and wellness coach and now a certified yoga instructor. Yoga has been her faithful companion for over 10 years and while navigating a midlife reinvention she found herself deepening her mindfulness and meditation practice as she sought to uncover and nourish her true, authentic self. Her continued practice both spiritually and physically on the mat has been the perfect combination to nourish her self care, self discipline, and to honor her own inner light. Tami loves to inspire her students by giving them an invitation, space and knowledge to find their own true path towards the best vision of themselves. Her journey landed her right into the Amalam School for her certification this past winter. "The most divine space for mind, body, and spirit to meet on the mat. Working with Anne was one of the most profound experiences in my life" she states. Tami is the mother of four wonderful children and married to a devoted and talented chef-restaurateur husband. Tami and her husband share a wanderlust and curiosity of the world that keeps them constantly seeking new adventure and blue water to kite board, fish, and explore. Tami's attention to mindfulness along with her gentle vinyasa flow will leave you feeling renewed, refreshed and with an inspiring perspective to carry with you on and off the mat. I began practicing yoga almost 20 years ago as a teenager. I found myself drawn to the practice, but with no classes available to me, I learned from books and videos. Jane Fonda and Ali McGraw were my first teachers! Several years later, I finally made my way to my first real class while traveling in Mexico. My teacher didn't speak English and my Spanish was rusty, but luckily I found that we had a common language in yoga. I was so blessed to find a yoga home and participate in teacher training at Outer Banks Yoga. Initially, I enrolled in the teacher training solely to deepen my own practice, believing that my crippling fear of public speaking would prevent me from teaching a single class beyond those required for training. Much to my surprise and amazement, I found that I fell in love with teaching, and with the breadth of knowledge I received from Anne and Michelle, I couldn't feel any less than 100% confident in front of a class. It is with tremendous awe and gratitude that I teach today, and with the hope that I can help my students experience the peace, joy, and freedom that yoga has brought to my life. Beverly has been practicing yoga since 2001. While she had toyed with the idea of becoming a certified yoga teacher for years, it became a reality for her right here on the Outer Banks at the Amalam School of Yoga. She has long had a passion for yoga for many years and maintains a strong regular practice as well as teaching. Her strong faith and regular yoga practice has helped her through major life changing events. She wishes to share with others the many benefits of a regular yoga practice no matter what age you may be! Erica loves yoga so much it’s infectious! It makes her so incredibly happy that she feels it would be selfish not to share this path of bliss with anyone she can. Even though she enjoys yoga in all its forms, Ashtanga yoga has made the most impact on her personal practice. Her classes reflect her love of dance, and you will find yourself forgetting about the hard work you’re doing and dancing your way through class with her super fun and flowy sequences. She is a teacher who cares a lot about her students, and whose goal is to make sure that everyone who comes to her class leaves feeling accomplished. Sharing energy, movement, stillness and laughter with yogis of all levels makes me smile! I don't take myself too seriously and hope that translates in my teaching style - we are all learning together. Yoga has come in and out of my life for the past 20 years, mostly for the more obvious physical benefits. Soul searching kept bringing me back to class, not for a great beach body, but for the inner strength that stayed with me afterwards. I completed my teacher training here at Outer Banks Yoga's Amalam School of Yoga. Outside of the studio I'm mama to two beautiful little souls, wife to one sweet husband and personal chef for many Outer Banks visitors. Lots of time spent outdoors in any way, shape or form, travelling and seeing live music makes for a full life. Jim has practiced meditation for over 30 years. He has participated in trainings and retreats under many different teachers: notably Sharon Salzberg, Tara Brach, Christina Feldman and others in the Theraveda tradition as well as Tsoknyi Rinpoche in the Tibetan method. Jim, a Licensed Professional Counselor, has practiced as a therapist for 35 years. He has had extensive training in Gestalt Therapy. For the past 6 years, Jim has utilized meditation and Eastern Psychology in “mindfulness” therapy. Jim and his wife, Margie Dinger, have lived on the Outer Banks for many years. They currently live on The Woods Road with their three dogs (who also have a limited meditation practice utlizing the chew toy method). Julia is an eastern North Carolina native with an early background in ballet and martial arts that led her to T’ai Chi. A recent graduate of the Cayce Riley School of Massage as well as a graduate of the Asheville Yoga Center and the Pilates Certification Center, Julia’s classes take you through an energetic flow of postures and movements that calm the mind and invigorate the body. These routines are designed to achieve maximum circulation through movement with a serious emphasis on pranayama and special attention to the lower back. Each of her classes ends with a beautiful meditation which combines inspirational messages through yoga nidra and not-to-be-missed soothing massage. With an ever-present interest in pain relief and rehabilitation, Julia is currently studying various forms of yoga therapy. You may see her on various Outer Banks bike trails, kayaking in Kitty Hawk Bay. Kathy is a long-time resident of the Outer Banks moving here from Northern Virginia 33 years ago. Her connection with yoga began while living in Virginia, and she reconnected with the practice 3-4 years ago after attending a yoga retreat in Corolla. Family and friends claim that Kathy “marches to the beat of a different drummer,” and she is just grateful that she marched through the front door of Outer Banks Yoga! As a health enthusiast Kathy claims that, “In addition to a healthy diet and well-rounded exercise program, ‘laughter is the best medicine' so she lives and works in a fun-loving but hard-working environment... and with laughter, the end result is a higher quality and faster completion of tasks. Kathy lives with her husband and two dogs who are her biggest contributors to her laughter and every day support. It was her husband who insisted that Kathy attend the yoga retreat that reconnected her to yoga. Even though she thought she would be retired by now, after 18 years Kathy continues to work as an administrative assistant with an environmental consulting firm in Kill Devil Hills. Outside of yoga some of Kathy’s interests include: "all creatures great & small,” writing, dancing, and observing (everything). Linnea took her first yoga class 15 years ago and fell in love with it. She revisited yoga off and on over the years and then really got the yoga bug in 2012 once her four children were all in school. Her passion for yoga led her to Outer Banks Yoga Studio where she studied with Anne Howard Follenbach and graduated RYT 200 in 2016. Always eager to learn, explore, and share, Linnea's classes pay close attention to alignment and breath. With a free spirited teaching style influenced by her study in vinyasa. She encourages students to embrace their unique flow in life on and off the mat. Marty started practicing yoga in 1992 after having a serious surgery. Looking for a way to rebuild her strength and find an inner peace, yoga was the perfect solution. After many classes of various forms of yoga, and the guidance of some amazing instructors, Marty realized that her yoga journey was just beginning. Wanting to share her love of yoga, in April 2005, she spent an amazing month studying Integral Yoga at the Satchidananda Ashram-Yogaville in Buckingham, Va. She started teaching at Outer Banks Yoga and Pilates in May 2005. She has also taught classes at College Of The Albemarle, for the Town Of Nags Head and other fitness centers along the Outer Banks. Marty teaches a gentle class with an emphasis on pranayama, mindfulness, and deep relaxation. In every class Marty teaches, you are reminded that yoga is not a competition, not even with yourself. So if you are a beginner, or you have been practicing as long as you can remember, perhaps a gentle class would be just what you need. Born and raised on the beaches of the New Jersey Shore, and a proud and devoted Dad of three beautiful, smart and inately kind kids. Scott is a Long time board member and coach here in Dare County. He is also the owner/operator of Hatties Wholesale Produce and Culinary Specialties. I am so completely grateful and dedicated to my yoga practice, everyday absorbing more and more knowledge of the practice and of myself, that I’m driven to share, if I can stimulate even the tiniest spark of desire in someone or make even the smallest improvement in how someone feels on or off their mat, then I’m complete. I'm honored to be a member of the Outer Banks Yoga family,. A life of martial arts training helped Susan appreciate the quiet gentle strengthening benefits of yoga flow and restorative yoga. She found that yoga healed her body, mind and spirit in a successful fight with breast cancer. Yoga works in harmony with other physical and mental activities to bring inner peace, focus and strength. Yoga is a wonderful way to pause the busy demands of every day life. It is a way to stay in touch with your spirit and heart and stay connected with your body. An hour of serenity and bliss within a day promotes peace of mind. Proven physical benefits of yoga are plentiful. The slower mindful breathing tends to reduce stress. Asana poses decrease lactic acid in muscles to help reduce joint pain. A regular practice over time will increase arm strength, muscle tone, improve posture, increase flexibility, improve focus, increase metabolism, help digestion and increase lung capacity. But the real gift of Yoga is the calming of mind, body and spirit while it builds inner and outer strength by connecting breath with movement. Susan received her 200-hour Yoga Teacher Certification from Anne Follenbach-Howard here at the Amalam School of Yoga at Outer Banks Yoga. She is continually fascinated by how yoga combines breath, movement, loving kindness and insight; bringing balance between work and life. She teaches classes with emphasis on internal awareness and self-acceptance. She believes you can change anything about yourself you wish to change; your shape, your outlook, your experiences, your life. Balance is the position many of us are looking for on our life path. Tanya began her yoga practice five years ago while in search of this mysterious concept and discovered that yoga was the venue that created more balance in her life. By honoring the body and acknowledging where we are at this particular moment, she believes yoga can provide physical, mental, emotional, and spiritual gifts to increase and sustain overall well-being. She acknowledges that her own yoga practice has guided her through some of the most significant storms in her life and brought her through them with acceptance, forgiveness and gratitude. She completed her teacher training here at the Amalam School of Yoga. Tanya is also a Licensed Clinical Social Worker who works in private practice.